Earlier this month, Dorkaholics had the honor and privilege of getting to know Jen Takeda at Anime Expo through a photo shoot opportunity and Q&A. 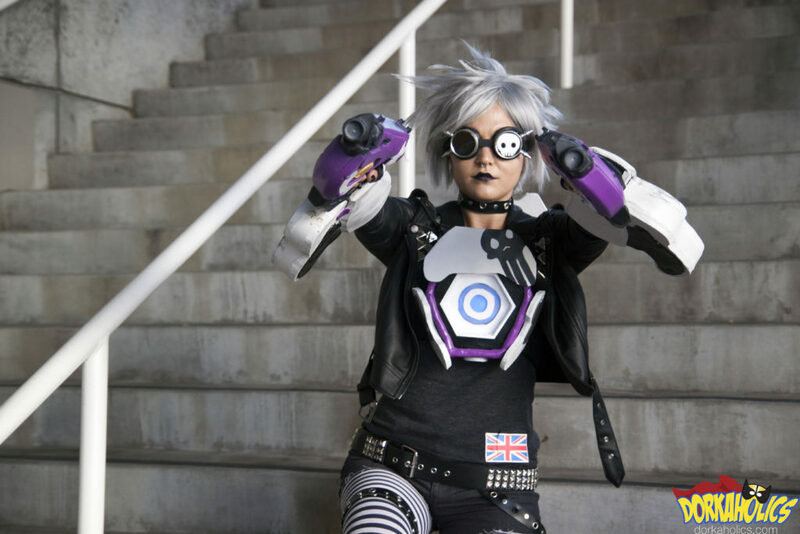 Jen showcased her latest cosplay, Ultraviolet Tracer from Overwatch! Though I have been going to conventions for over a decade, I’ve only been cosplaying for a little over two years. I always wanted to try cosplaying, but it took me quite a while to build up the courage to do it. My first cosplay was Tank Girl. I didn’t know how to sew at the time, so it was made up of mostly things I found at thrift stores. The first cosplay I made myself was Nonon from Kill la Kill’s Symphony Regalia Grave. How long did it take for you to complete your Tracer cosplay? It took me a couple of weeks to complete. The clothing was pretty easy since it was mainly stuff I could thrift for then alter. The thing that took the most time was her chronal accelerators (chest and back armored pieces) since there’s not a ton of good references for them and it was my first time building such a difficult prop. What were you most excited for at Anime Expo this year? I love seeing all the cosplayers and their amazing work! There are so many people at Anime Expo who make exquisitely beautiful cosplays. It really drives me to keep improving my skills and make even better cosplays myself. What’s the next event you’ll be attending? I will be attending EVO in a couple weeks, which I’m really excited for. After that me next event will be Anime California in September. What are you doing when you’re not in costume, gaming, collecting toys, or just being a Dorkaholic? I like going out dancing, playing with my cat, painting, and spending time with my family and friends. I currently work as a teaching assistant at a school for children with special needs, and I really enjoy that too. Any advice for someone interested in getting started in cosplaying? My biggest piece of advice that I always say, as corny as it sounds, is that practice make perfect. It’s difficult for most people to try something new, especially if it means failing at times. But that is all a part of learning, and eventually becoming good at something. Don’t let your mistakes intimidate you; learn from them. When I first started sewing a couple years ago, I couldn’t’ even make a straight line. I’d get really frustrated, but I kept trying, and now I am so happy with my progress and the costumes I can make.